Facebook is powered by machine learning and AI. From advertising relevance, news feed and search ranking to computer vision, face recognition, and speech recognition, they run ML models at massive scale, computing trillions of predictions every day. 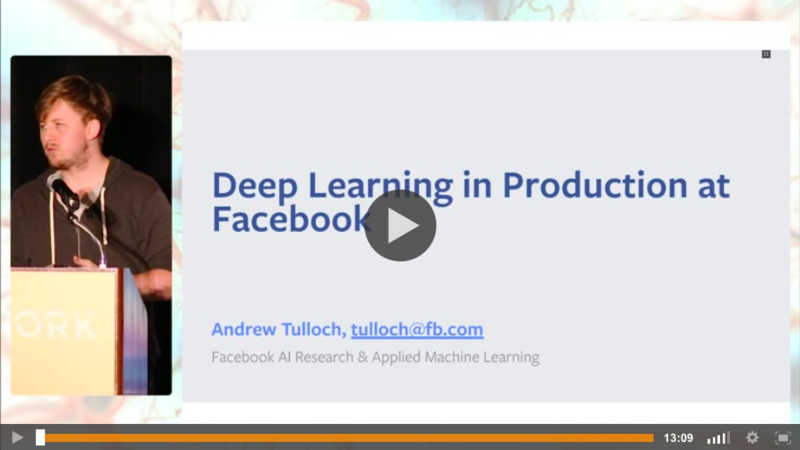 At the 2016 Deep Learning Summit in Boston, Andrew Tulloch, Research Engineer at Facebook, talked about some of the tools and tricks Facebook use for scaling both the training and deployment of some of their deep learning models at Facebook. He also covered some useful libraries that they'd open-sourced for production-oriented deep learning applications. Tulloch's session can be watched in full below. At the third annual Boston Deep Learning Summit on 25 - 26 May 2017, opportunities of advancing trends in deep learning and their impact on business and society will be showcased by a global line-up of experts. Answering questions as to whether 'smart artificial intelligence will finally rival human intelligence' and more. To register for the 2017 Deep Learning Summit in Boston click here. You can also view more presentations and interviews on the RE•WORK video hub. The next Boston Deep Learning Summit takes place on 25-26 May! Previous speakers included Tony Jebara, Director of Machine Learning Research at Netflix; Spyros Matsoukas, Principle Scientist at Amazon; Hugo Larochelle, Research Scientist at Twitter; John Hershey, Senior Principle Research Scientist at Mitsubishi Electric Research Labs and Yoshua Bengio, Daniel McDuff, Director of Research at Affectiva. Book your pass here. See the full events list here for events focused on AI, Deep Learning and Machine Intelligence taking place in San Francisco, London, Singapore, Boston, Amsterdam, New York and Hong Kong.